Aker BP, a partner in Norway's giant Johan Sverdrup oilfield, expects a fast ramp-up of production when the initial development phase ends in late 2019, its chief executive said on Thursday. "I think it will be done in a few months, because the production per well is so high," Karl Johnny Hersvik told Reuters on the sidelines of an energy conference. 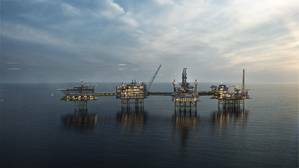 Johan Sverdrup Phase 1 will have capacity to produce 440,000 barrels of oil equivalents per day (boed), while the second phase, starting production in 2022, is expected to further boost output to 660,000 boed. Sweden's Lundin Petroleum, another partner in the Equinor-operated, on Wednesday said it expected the field to start producing before November next year. Equinor has said it expects the field to start in late 2019 but has not provided an estimate for when the first phase could reach full capacity.